Gordon State College is enhancing students’ career opportunities with a regional workforce development collaboration the college established through the Carl Vinson Institute of Government. Employers, educators and community leaders in Gordon State’s 14-county primary service region are partnering with the college to better align degree and job readiness programs with west-central Georgia’s workforce needs. 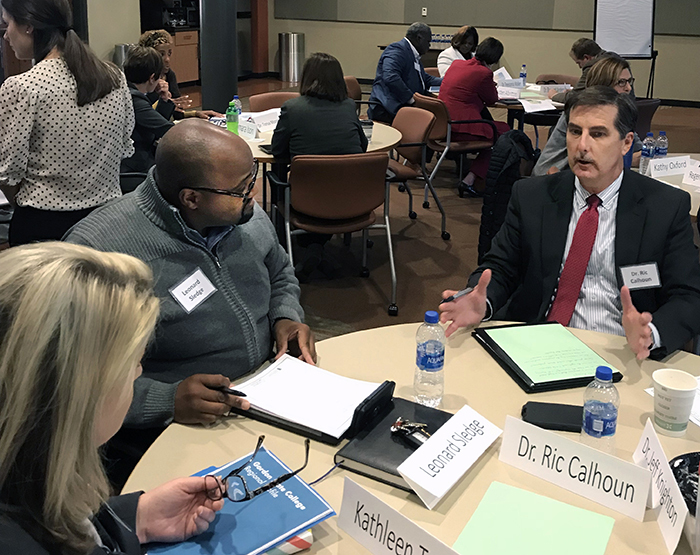 The Institute of Government worked with Gordon State administrators to identify in-demand job skills in the region between metro Atlanta and Macon and organize a 34-member steering committee that implemented strategies to create an effective workforce development program. Dr. Kirk A. Nooks, Gordon State president and steering committee member, says the collaboration opens new possibilities for students, the college and the regional economy. “Based on our multiple meetings held over four months, we were fortunate to benefit from the ideas and feedback of supporters throughout our primary service region. Our region stands to gain from this work as we align our educational assets and talent needs to industry development,” Nooks said. Information developed through the collaboration will also inform Gordon State College’s new strategic plan, Nooks said. “Certainly included in the strategic plan will be the goal of developing deeper relationships with our K-12 partners and industry professionals. We want to ensure everyone will benefit from coordinated workforce development, which will ultimately move the region forward,” he said. Gordon State engaged the Institute of Government to provide technical assistance in developing the new strategic plan based on the success of establishing the workforce development program, according to Institute faculty member Greg Wilson. “We helped them to understand the current workforce development environment and establish effective ways to build region’s talent pipelines. Gordon State leaders saw that success as an opportunity to continue their partnership with us,” Wilson said. The workforce development steering committee brought Gordon State administrators together with economic development professionals, educators and business and political leaders representing Bibb, Butts, Clayton, Coweta, Crawford, Fayette, Henry, Lamar, Meriwether, Monroe, Pike, Spalding, Talbot and Upson counties. The collaboration established a critical network for economic development throughout the region, according to steering committee member Leonard Sledge, executive director of the Henry County Development Authority.